Weight aside, the more the better. Chassis bracing maintains alignment angles and spring rates by greatly reducing body or chassis flex. In fact, it helps every component in the suspension system do its job properly and you can feel the difference through improved turn-in, sharper steering response along with greater steering feedback. 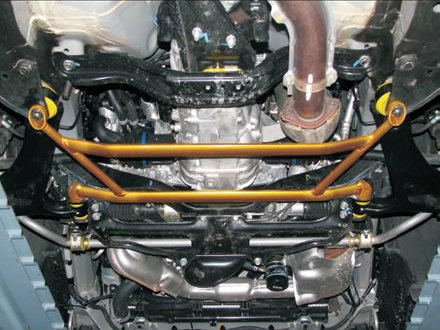 Whiteline strut bars/ strut brace/ strut tower bars not only makes your vehicle handle better they look great on the car as they feature premium polished alloy materials and powder coated end brackets. With regards to under car chassis bracing, Whiteline engineers have tested and identified up to 15mm body flex on late model vehicles under moderate acceleration, braking and cornering loads. Chassis bracing maintains alignment angles and spring rates by greatly reducing body or chassis flex. 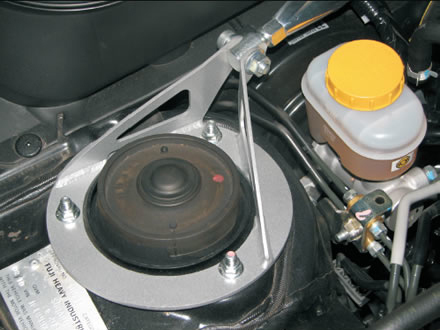 In fact, it helps every component in the suspension system do its job properly. Race cars have elaborate roll cages not just to protect the occupant, a good proportion of its job is to stiffen the chassis. That's why it triangulates and links every major chassis and suspension pickup point with each other. Critical for serious performance and essential for any car with uprated springs, shocks or sway bars.